Devoted to Sri Venkateswara, Tirumala Tirupati Temple is recognized as the second most visited shrine in the world and one of the top temples in South India. Nearly 50,000 to 100,000 pilgrims visit Tirupati Balaji temple daily. Further, the count reaches as high as up to 500,000 during festivals and on special occasions. A stunning example of Dravidian architecture, the Tirupati temple stands high on the Ventaka or Venkatachala Hill in Chittoor district of Andhra Pradesh. 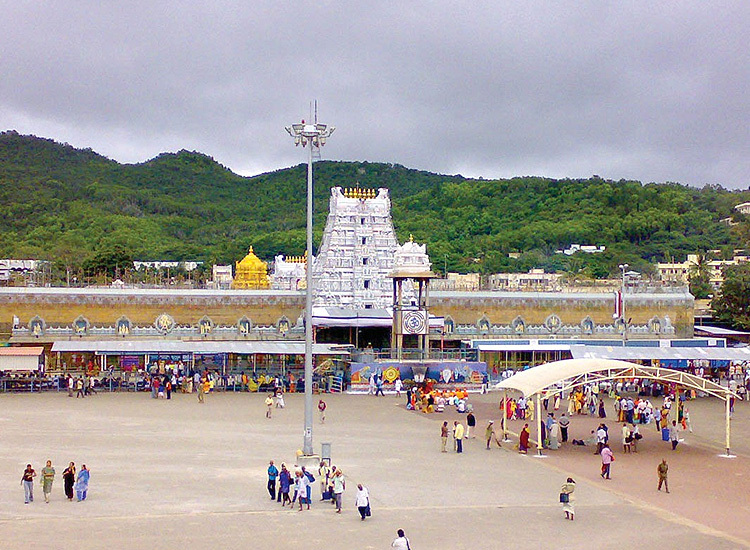 Dwelling on the seventh peak of Tirupati Hill, Sri Venkateswara is also called as the ‘Lord of the Seven Hills’. Abiding by the rituals of Hinduism, the Tirupati Balaji temple India follows the philosophy of love, equality and prohibits sacrificial offerings of animals. The donations given by the devotees and the immense wealth make it one of the richest temples in the world. The Tirumala temple houses Tarigonda Vengamamba Annaprasadam complex which offers free meals to pilgrims. The sanctum sanctorum also has two modern Queue complex buildings for organizing the rush. Various pilgrim lodging sites and hair tonsure buildings can also be spotted within the premises. The Tirupati balaji temple is one of the eight Vishnu Swayambhu Kshetras and the last earthly Divya Desam. Thus, it becomes more important to go for Tirupati darshan, pay homage to Lord Vishnu and seek his blessings. Tirupati temple in South India has a rich historical legacy associated with it. The reins of the temple have been transferred from one hand to another. Various dynasties and rulers have presided over the shrine. The sequential order being that of the Pallavas, Cholas, Vijaynagar Pradhans, Golcondas, French, Nawab of Carnatic, East India Company, Mahants of Hathiramji Muth, TTD and AP State Endowments Dept. The first noted donation at the Tirupati Balaji temple India was made in 966 CE by Samavai, queen of the Pallava dynasty. She donated numerous jewels and two parcels of lands to be used as the revenue generating resources for the celebration of festivals. However, the temple became rich during the Vijayanagara Realm. The roof of the Ananda Nilayam was gilded because of the offerings presented by the Krishnadevaraya in the form of jewels and gold. Under the rule of East India Company in the 19th-century, the Balaji Temple was leased for auction to a tenant. The tenant was ordered to pay a fixed price to the Company by charging fees and collecting taxes for Sevas in Temple. The walls of the Tirupati Balaji temple depict the tales of endowments and patronage of the dynasties which ruled it. Why is Tirumala Temple so famous? The significance and heavenly atmosphere of Tirumala Temple enchant millions of devotees from far and near. It is a common belief that Lord Sri Venkateswara appeared at the here to protect human beings from the problems of ‘Kalyug’. Thus, the shrine got another name as the Kaliyuga Vaikuntham and God is known as Kaliyuga Prathyaksha Daivam. It is suggested in various ancient scriptures that worshiping Sri Venkateswara is the ultimate way to get moksha, in Kalyug. The Rig Veda and Asthadasa Puranas strongly recommend visiting Tirupati Temple. Dhruva Beram or Moolavirat – Lord Venkateswara is the presiding deity of the Tirupati Balaji temple. Regarded as the major source of energy, he is also known as Dhruva Beram. Bhoga Srinivasa or Kautuka Beram – A small one-foot silver idol which delights in all the Bhoga (worldly pleasures) which the devotees wish to offer to the God which is not possible with Moolavirat. Ugra Srinivasa or Snapana Beram– This deity portrays the fearsome feature of the lord. Ugra Srinivasa usually remains inside the temple. But the idol comes out on Kaishika Dwadasi every year, before the sunrise. Malayappa swami or Utsava Beram— Utsava Beram is the idol of Sri Venkateswara which is used in processions through the city for time to time. Alternatively known as Malayappa, it is always accompanied by the berams of Bhudevi and Sridevi, the two spouses of God. Koluvu Srinivasa or Bali Beram — Made up of an alloy of five metals, this Pancha-loha idol look likes the main deity. It is chief in charge of all the rituals and activities in the Tirupati Balaji temple India. According to a legend, Goddess Lakshmi felt insulted by Brigu Rishi who kicked Lord Vishnu on his chest. After this, she had a fight with God and left her heavenly abode, the Vaikunta. Due to this she landed on Earth and settled here. In search of his beloved, Lord Vishnu also came to earth and was named as Srinivasa. After all his efforts went in vain, he decided to dwell at Tirumala hills and continue his search. Meanwhile, he met the beautiful daughter of the King of the seven hills in Tirumala, Padmavati. Upon falling in love, they decided to settle into wedlock. A huge price was demanded by the king. Thus, Lord Vishnu took a loan of one crore and 11.4 million gold coins from Kubera. He agreed but imposed a condition that Vishnu can’t go back to Vaikuntha without paying off the debt. To this, God Vishnu agreed and married Padmavathi. Knowing about the marriage, Lakshmi came to question him. But he soon transformed into an idol upon confronting the Goddess. Since then, Lord Vishnu is staying at Tirupati Balaji temple until the debts are paid. Brahma and Shiva, the Hindu Gods, explained Lakshmi that it was the Lord’s desire to be here to help human beings from everlasting troubles of Kalyug. Goddess Lakshmi and Padamavathi also decided to stay with him here. Thus, devotees offer numerous precious things and a huge amount of money in the donation, to help their lord to pay off the debts. What to see inside Tirupati Balaji Temple? Tirupati Balaji temple depicts the Indian legacy. It has a special position from a spiritual perspective and thus various tourists visit here. There are numerous things to see inside the temple. Center of attraction being the main idol of the Lord Sri Venkateswara. Prakarams – the three enclosures of the shrine. The outmost enclosure consist of the ‘Dhvajastambha’ (banner post) and the other enclosures contain many sculptures including statues of Todarmal and King Krishnadevraya. Brahmotsavam – the annual festival celebrated for nine days in September with great pomp and show. Processions are carried out throughout the city. The Utsava Beram is used for the same and is accompanied by the idols of Bhudevi and Sridevi. Besides these, there are numerous places to visit nearby. Daily Rituals – Some of the sevas like Thomala Seva and Suprabhata Seva etc. take place in the Tirupati temple daily. Weekly Rituals – Various Weekly sevas are held in the temple from Monday to Friday. However, there are no sevas on weekends. Periodical Rituals – It includes Aaniwara Asthanam, Jyesthabhishekam, Koil Alwar Tirumanjanam and Pavithrotsavam. The ancient scriptures suggest worshiping Vishnu six times daily. Out of the six, worshiping at least once is mandatory. Of the given six, only three pujas are performed in the Tirupati temple every day. It includes UshaKala puja, Madhyahna puja and Nisi puja. Many people including ladies shave their heads and donate hair as an offering to the Lord. It is known as ‘Mokku’. More than a ton of hair is collected daily. These are then auctioned and generate an income for the temple. Usually performed with newborns, it is another form of donation. The baby or the person is made to sit on one side of the weighing scale and another part is filled with gold coins, tulsi leaves, sugar, jaggery etc. Once both the pans are balanced, the things on the other pan are donated to the Tirupati Balaji temple India by the person. In order to provide quick and hassle-free Tirupati darshan to the devotees, the special entry darshan was introduced. Also known as the Seeghra Darshanam, it is a boon for the pilgrims having some time restrictions. The special Tirupati darshan booking is open round the clock. Furthermore, the pilgrims can book tickets for Tirumala darshan 3 hours prior to darshan slot. However, this is subjected to the availability of quota. Also, they make the eHundi offerings while booking tickets. However, for advance booking of the Tirupati Balaji darshan via special entry, devotees can head to e-Darshan counters or Indian Post Offices. They can also do the same by browsing the official website of Tirumala Tirupati Devasthanams. Located on the on the southern banks of Sri Swami Pushkarini, a holy water tank, Tirupati Balaji Temple is easily accessible. Various tours from Chennai are also available daily. Nearest airport to Temple is in Renigunta which is at a distance of 10 km. Nearest Railway Station is Tirupati which is at a distance of 26 km. Nearest Bus Stop is Tirupati Bus Stop and the distance is 569 km. The best time to plan a holy tour to Tirupati Balaji Temple is from November to February. Although the temple is visited throughout the year, but it is better to avoid the summer season which starts from March and runs till September. The reason being that the temperature soars up to 42 degree Celsius. However, during the winter months, i.e. from November to February, the weather remains pleasant and is best suited for visiting Tirupati Balaji. Repeat the words ‘Om Namo Narayanaaya’ and set on for this holy sojourn. Pilgrims can easily look for rooms in Tirumala near the temple for comfortable accommodation. The official website of the temple makes the process of booking, rooms in Tirupati easy. Now, pilgrims can easily delight in a comfortable stay in Tirumala or Tirupati. Besides this, there is a multitude of hotels near Tirupati Balaji temple that can cater to all your needs. 2 comments on "A Guide to The Richest Temple of India – Tirupati Balaji Temple"
This place is amazing indeed. Keep following our blogs to know more.